Objective of Planning Ability Test is to audit your notional planning capacity in developing situations in terms of foresighted decision making under time pressure. 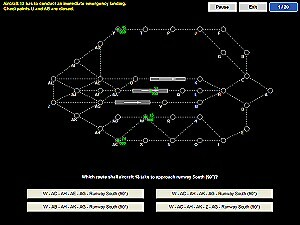 The test setup compiles abstracted airspaces that comprise multiple checkpoints and airport runways. A static snapshot states the current situation in a respective airspace. You are to find the answers to problems that regard starting or landing aircraft by developing a dynamic planning concept under which the situation could progress. Several rules that need to be complied with have to be taken into account in this effort.